Are Exam Results giving you ‘The Fear’?! DON’T worry. If your results have left you confused or uncertain about which career option to choose, or if you’re not even sure which options are open to you, there is help at hand. Glasgow Kelvin College still has a limited number of places available on full-time courses starting later this month. 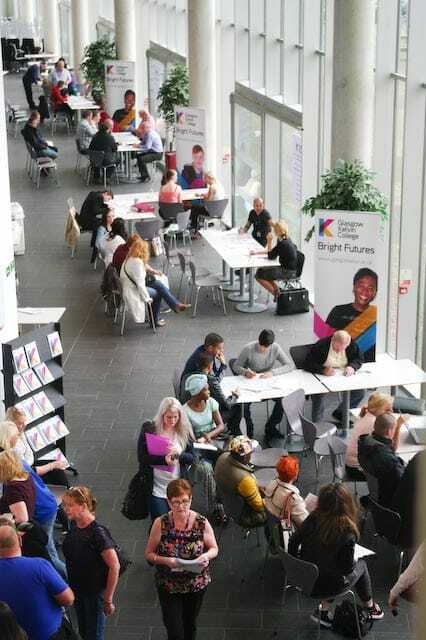 Glasgow Kelvin College will be holding an Open Day at its Springburn Campus, 123 Flemington Street G21 4TD between 10am and 3pm on Wednesday 15th August, 2018 where you can drop in and discuss your options. 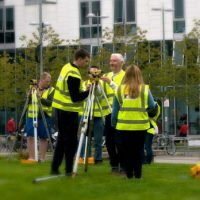 The College has four campuses - in Easterhouse, East End, Maryhill and Springburn - and offers a wide range of courses in many different subject areas. All full-time programmes at Glasgow Kelvin lead on to further study or employment. The College is keen also to encourage applicants to make ‘non-traditional’ choices in their learning journey. There are excellent career opportunities for females in the science, engineering and technology areas; while there are equally good prospects for men entering into the childcare, caring, nursing and hairdressing professions. Not all courses require you to have formal qualifications beforehand and the College offers programmes from entry level to advanced level, ensuring access and providing a stimulating learner journey to all levels of ability. 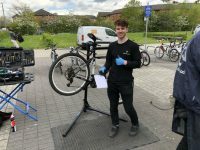 Most courses carry a work-experience or employability element which ensures that Kelvin students have industry-relevant skills – vocational and personal – to help them access the best careers and achieve more from their working life in a competitive jobs market. The development of skills in STEM subjects is high on the Scottish Government employment agenda. And the career options open to successful students from these programmes are almost infinite. STEM subjects are used in almost every walk of life today. Even career areas which may not seem obvious utilise STEM skills. The creative industries, for example, are now utilising many of the new digital technologies with the advent of 3D Printing and Computer Aided Design. So if you’ve just got your results and have still to decide on a career option, or if your plans have changed, check our courses with places still available here to help you make your decision or come along to the Open Day on 15th August 2018. 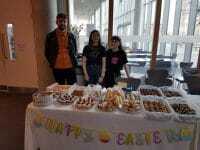 See you at Springburn Campus! MSP Bob Doris is rolling out the White Ribbon Scotland campaign into his constituency of Maryhill and Springburn with the support of local bookmakers. Glasgow Kelvin College’s White Ribbon Scotland campaign has received a boost with the backing of its local MSP Bob Doris, who has helped establish links with bookmakers in the area. He is driving an innovative initiative to target men at the heart of the community. Employees of Ladbrokes Coral and William Hill have been undergoing training to become campaign ambassadors and help promote the White Ribbon aims which give men a voice in the opposition of violence against women and other forms of domestic violence. The training is being provided by students and staff from Glasgow Kelvin College whose successful White Ribbon Scotland campaign has picked up a series of national nominations and awards over the last two years. The College is delighted that its campaign is being rolled out in this way. White Ribbon Scotland contributes to ending violence against women by engaging men and boys in taking action on the issue. They do this by raising awareness, promoting discussion and providing information and resources to support personal and collective action among men. This initiative ensures that the White Ribbon message is being communicated to men in ‘hard to reach’ groups and betting shop staff are keen to promote this to their customers. 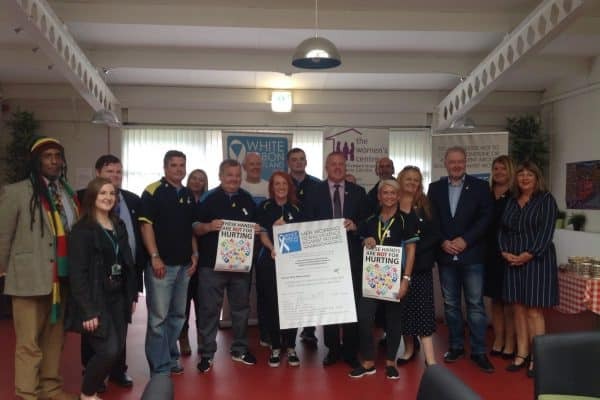 The official launch of the Week of Action is set to take place on 4th August with a campaign stall on Maryhill Road at Tesco (corner of Shakespeare Street) where the public will be encouraged to sign up to the White Ribbon Scotland Pledge. Staff from local bookmaker stores will play an active part. Bob and Davy are pictured here with local councillors, betting shop staff, Donald Morrison of the Association of British Bookmakers, Glasgow Kelvin College Students’ Association representatives and Lynne Robertson of North West Women’s Centre. 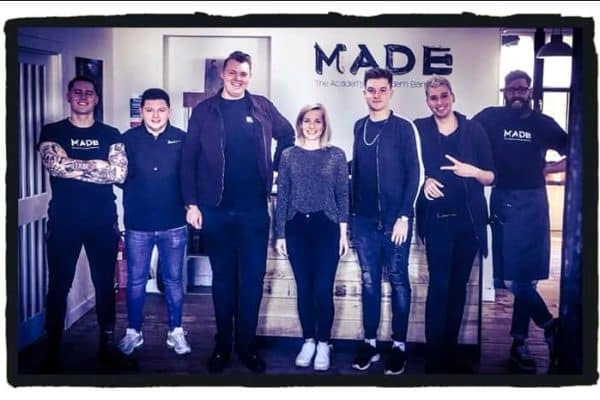 Glasgow Kelvin College’s partnership programme with innovative Rebel Rebel and Made – Academy of Modern Barbering is now receiving international coverage. It’s great to get this kind of feedback to help us assess the positive impact of the transnational exchange programmes. We certainly enjoyed having them here to work with our students and look forward to continuing our links with Nuremberg! 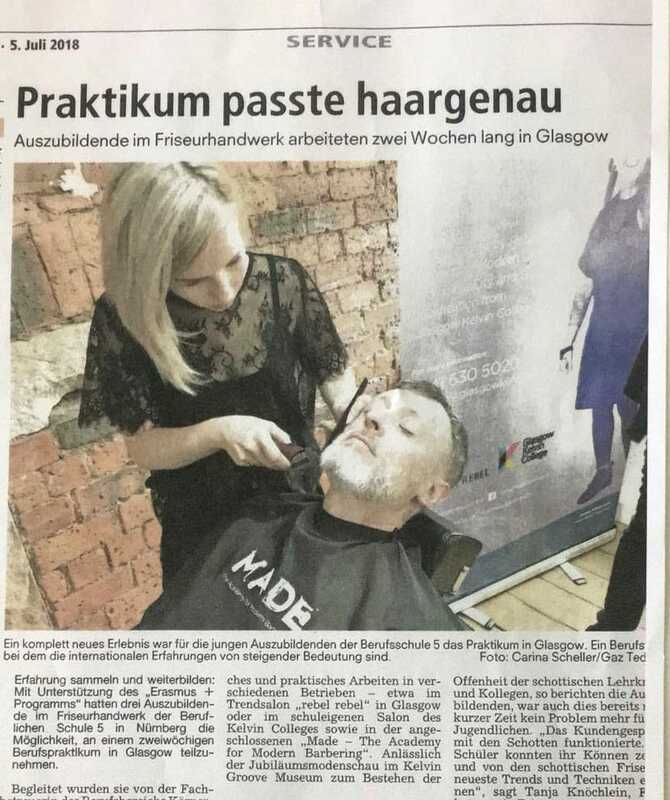 Gaining experience and training with the support of the Erasmus Program was a great opportunity for the 3 young trainees from the Hairdressing School in Nuremberg, who took part in a 2-week training course in Glasgow. They were accompanied by a professional supervisor, Tanja Knöchlein. For two years there has been a fruitful partnership between Glasgow Kelvin College and the Hairdressing and Beauty School in Nuremberg. Experts say that international experience is of great importance in this profession and creating opportunities for young professionals through training programs with other countries is a remarkable opportunity to learn and improve. The two weeks spent in Glasgow were eventful for the three trainees. They worked in various places - for example in the "Rebel Rebel" in Glasgow, in the salon of Glasgow Kelvin College as well as in "Made - The Academy for Modern Barbering" in Glasgow. To mark the 10-year-anniversary of the partnership between the Fashion School and Glasgow Kelvin College, they presented a Fashion show event which took place in the Kelvingrove Museum. It was a big challenge for the young trainees. There were doubts as to whether their English was sufficient and they could manage to grasp the ‘famous Glaswegian dialect’, which might be challenging to a foreign ear. But those concerns were soon overcome thanks to the cordiality of the College. The support of the Scottish community and colleagues helped them overcome language barriers. 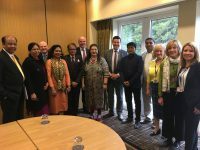 "The partnership with the Scots worked very well, students were able to get to know the latest hairdressing/beauty trends and techniques through this opportunity” said Tanja Knöchlein. 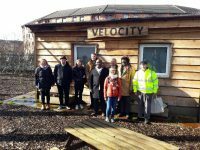 In addition, the youngsters learned a great deal about the Scottish culture and gained insights into the professional world and way of life in this country. This has left a long-lasting positive experience for the young professional. Prospects through these training programs offer better practical experience for young professionals therefore it’s hoped there will be further openings for future professional development in France and Finland. See teaching block and holiday dates at a glance.